ECMOCO is an academic software for correcting linear eddy current and subject motion effects in diffusion weighted images (for details see below for details and Mohammadie et al. (2010)). To ensure that the maps with different image contrasts (e.g. due to differences in the diffusion weighting) are registered with sufficient precision a modality independent registration approach based on mutual information is used (details can be found in the SPM tool "spm_corg"). ECMOCO is based on the spm_coreg and developed by Siawoosh Mohammadi. Go to this wiki for instruction how to use this toolbox. Fig. 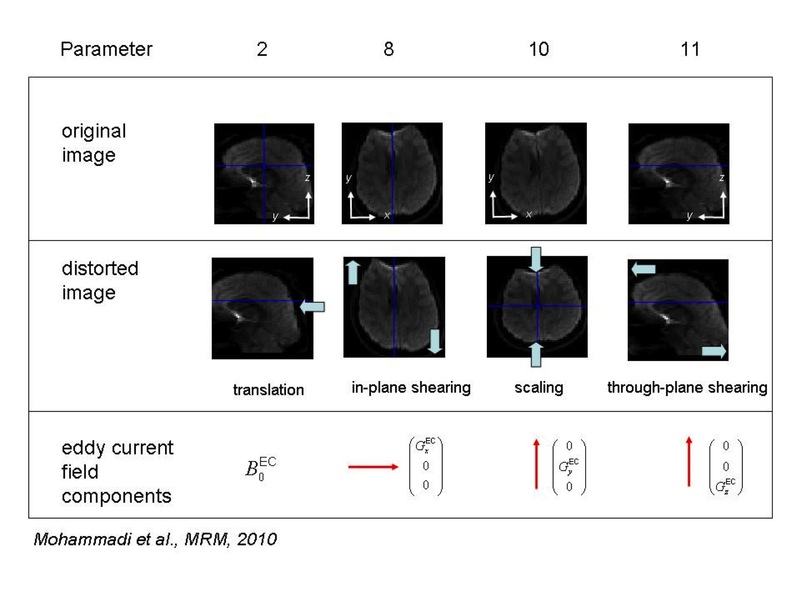 1: The whole-brain eddy current distortions (3rd row) are corrected by affine transformations when the corresponding parameters (2, 8, 10 and 11, 1st row) are enabled. Note that this toolbox only corrects for image distortions that are related to the linear components of the EC field (4th row).